Our approach is a “Learn By Doing” model. We teach skills to see processes from a “systems thinking” perspective (cognitive), coach on how to act differently in a continuous improvement culture (behavioral) and then provide the participants the opportunity to practice their knew skills and knowledge on a business problem in a semi-controlled environment (interpersonal). By working this way, we create a learning environment, solve real business problems and build a platform from which co-workers create a solid learning foundation. From this point, we encourage the learner to become the teacher and help others to become learners to create the continuous improvement culture and a learning organization. If you know you are ready to get started and are looking for a coach, we are here to help. In this case, you may have already identified a cross functional problem with one of your Value Streams and are seeking improvement for your customer. If this is your scenario, a Value Stream Improvement Workshop is the approach to teach others to see problems systemically and begin to apply problem solving skills to improve the work stream. 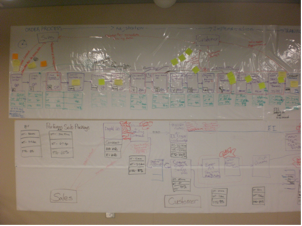 The pictures below are typical of a Value Stream Mapping Learning Workshop. 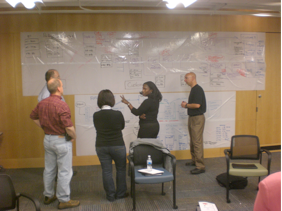 As you see, participants are actively involved in developing an accurate picture of the current condition of the business process. In subsequent sessions, the participants discuss, present and develop action plans to implement their solutions to improving the process through the elimination of waste and to provide greater value for the processes customer. Applying the learning to create a current state map of the process selected to improve over the course of the three day workshop. This is a visual representation of the process with measurements of the current process in place. In this picture, the team is beginning to identify waste in the process by applying yellow post-its to the map to indicate the process step adds no value to the downstream customer and either adds cost to the business or has a detrimental effect on safety, quality or delivery time. 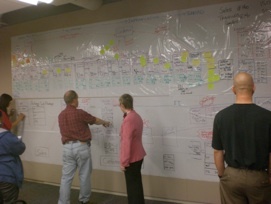 The team collaborates to create a visual representation of the process. By drawing the process and discussing it with a visual representation, the discussion becomes about the work, not about the people who do the work. Not all maps are “wall size”. The selected process and the size of the workshop team establishes the depth of detail with which the map is developed. This is one of the key criteria discussed in the pre-workshop on-site scoping day. The proposed attendee list is reviewed to ensure appropriate representation of the process is present in the workshop. Based on the learning lean principles’ on Day 2 of the workshop, the attendees apply the learning to their current state and CREATE an improved process (future state). The future state process is designed by the attendees to deliver greater value to the downstream customer with measured improvement in safety, quality, availability or lower costs. The workshop attendees are presenting the current condition of the process (current state map) and the suggested process (future state map) to senior leadership. 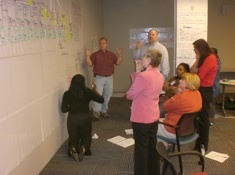 The team reviews the business benefits of applying lean principles learned in the workshop to the process. The attendees are taught the basics of using their future state value stream map to generate deliverables and dependencies of the actions identified on the map. The team is broken down into sub-teams and assigned responsibility to create the details required to implement the future state – typically in a ninety day timeframe. 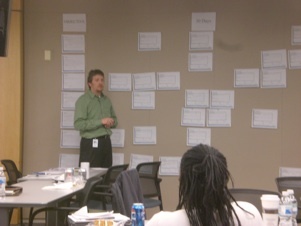 A team member is presenting to the group the specific task identified to implement a change to the current process as depicted on the future state map. 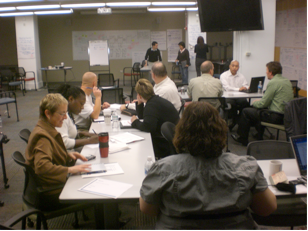 To “get improvement now” and discuss conducting a Value Stream Improvement workshop at your site and begin your Lean Learning, request a Value Stream Solutions Coach to contact you today.